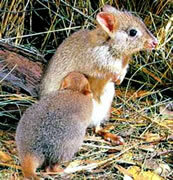 The brush-tailed rat-kangaroo is a small mammal found in Western Australia. It is a cross between a rat and a small wallaby. It is not a member of the rodent family but classed as a "marsupial," a group of mammals in which females possess pouches for rearing their young at infancy. Other members of the marsupial family include kangaroos, wallabies, and koala bears. Adults reach only 11.8 to 15 inches in length and weigh between 2.4 and 3.5 lbs. Their coats are yellowish-gray in color. Their feet are pale brown with bristly hairs, and their tails are long with a prominent black crest along the surface. Males and females are similar in appearance. They are able to use their tails, curled around in a prehensile manner, to carry bundles of material to build their nests. They are relatively slow-moving creatures but are able to hop away quickly with their heads held low, their tails extended, and their backs arched when disturbed. Brush-tailed rat-kangaroos prefer open forests and woodlands for their habitat. They appear to be solitary except when ready to mate, and they are only active at night. During the day, they can be found resting in nests made of grass and shredded bark and usually hidden under bushes or in shallow holes scraped in the ground. Their diet is very unusual for mammals and consists of bulbs, tubers, seeds, insects, resins, and underground fungi. Although these fungi are not considered a good food source for mammals in general, they provide nutrients necessary for the brush-tailed rat-kangaroo's health. Also, brush-tailed rat-kangaroos do not drink water or eat green plants. Mating occurs year round, and females give birth to one young after a gestation period of 21 days. The young remains in the mother's pouch for about 98 days, and then remains in the nest until a new infant is born. This creature once inhabited more than 60% of the Australian mainland. Today it only occurs in less than 1% due to competition with introduced grazing animals, habitat disturbance and degradation due to agriculture development, and predation by the introduced red fox. The Yelverton Brook Eco Spa Retreat, a 100-acre sanctuary in the Margaret River region of Western Australia, has successfully bred brush-tailed rat-kangaroos since 2004. 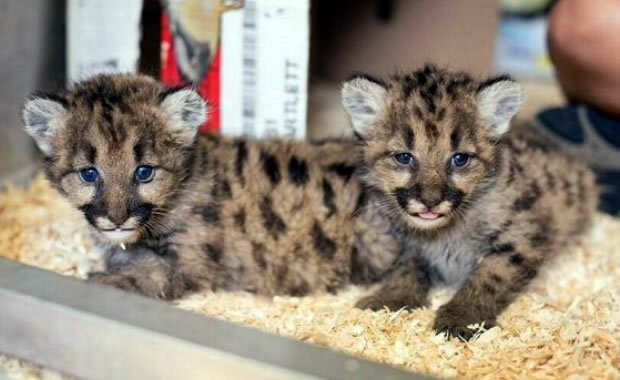 Some captive-bred specimens have been reintroduced into the wild on several islands in South Australia. Copyright Notice: This article is licensed under the GNU Free Documentation License. It uses material from the Wikipedia article "Woylie". Glenn, C. R. 2006. "Earth's Endangered Creatures - Brush-tailed Rat-kangaroo Facts" (Online). Accessed 4/25/2019 at http://earthsendangered.com/profile.asp?sp=394&ID=4. Need more Brush-tailed Rat-kangaroo facts?